Published on October 16, 2011 in Bands/Artists, Downloads, Exclusive, Media, Music, Personal History, Retail and Vinyl. 0 Comments Tags: brokeback, Calexico, Doug McCombs, Iron and Wine, Isotope 217, Noel Kupersmith, Our Soil, Our Strength, Quarterstick, Road Atlas, Road Atlas Mix, Rob Mazurek, Tortoise, Touch and Go, upcoming release, vinyl box set. The dusty desert highway of Tuscon-native band Calexico’s 15-year career is dotted with a notable collection of passionate Latin infused Americana (for lack of another general category to place them). While the band may not be familiar to most, their music shows up in many places– from interstitial music in NPR to movie soundtracks and in their many collaborations (including one fantastic album with The Iron and Wine). If only for these works, Calexico will stand as one of the important and influential American bands. Along this same highway of releases are the roadside attractions of Calexico’s self-released albums. 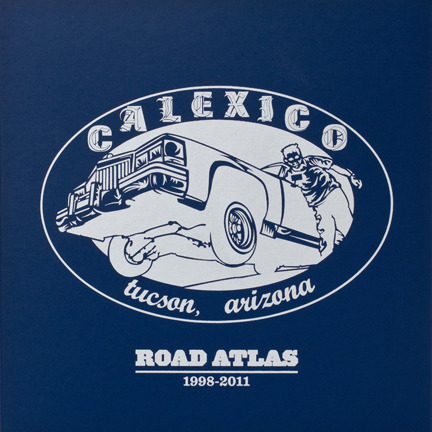 These generally “tour-only” albums were released under Calexico’s own imprint Our Soil, Our Strength and served sometimes as a clearing house of studio demos and projects that didn’t make it to other albums, live albums or other experiments. Ironically, maybe, it was through one of these albums that I was first exposed to Calexico. Someone posted the instrumental collection Travelall as mp3’s on the internet newsgroup alt.binaries.sounds.mp3 which left me initially of the opinion that Calexico was an instrumental post-rock similar to Tortoise. (I didn’t know it at the time, but Travelall has Thrill Jockey artists Rob Mazurek (Isotope 217, Chicago Underground), Doug McCombs (Tortoise, Brokeback, etc. ), and Noel Kupersmith (Brokeback, Chicago Underground Quartet) on it which lends some weight to that idea). This misconception was quickly dismissed with the 2006 release of Garden Ruin which quickly made me a fan of the band and motivated me to get all of their albums, including the tour-only releases which were all limited releases and quickly fell out of print, so I had to resort to Amazon and eBay to track the ones down I couldn’t get from the band’s website and from the band during the Garden Ruin tour. 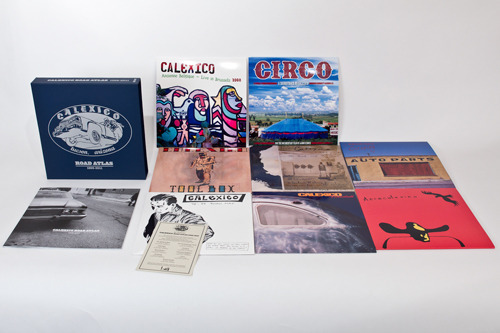 All of these releases are essential to the fan of Calexico, as they provide valuable insight to the band’s creative workouts. Not forced into an album format that would have appeal to a more casual listener, we are treated to a much richer view into the true heart of the band which include an audio treasure trove of atmospheric instrumentals, audio experiments, home demos, live performances, one-off collaborations and outtakes. After the announcement of Touch and Go/Quarterstick records– Calexico’s US label– in early 2009 that they would stop distribution of albums for a while I was concerned about the future of the band’s releases. The label managed to squeak the brilliant Carried to Dust in 2008, but that wasn’t the last release from the band– they put out the live album Live at Ancienne Belgique in 2009 on their own label, and produced the soundtracks to the documentary Circo, and the soundtrack to Don Cheadle-Brendan Gleeson Irish crime flick The Guard. A heavy duty, linen wrapped, screen-printed slip case to house it all! 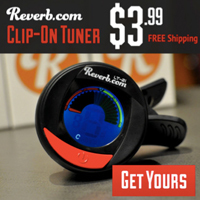 Priced at around $130, the box will be available via the band’s website, Touch and Go, Amazon and Insound.com. For those that don’t want to drop that kind of cash, there is also a great compilation CD of tracks from the box available as well. The Time to play b-sides archives for the vinyl-box-set tag.